Labor Day Sale: Popular Face Whisperer® Day Cream is 35% off from Sublime Beauty® Monday and Tuesday Only. 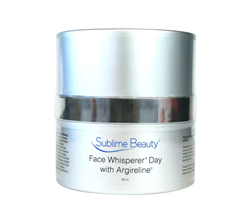 Face Whisperer® Day Cream with Argireline (known as the "natural botox") is on sale for Labor Day, found on Amazon. Take 35% off while quantities last. Our signature cream, in our signature line, Face Whisperer Day Cream is on sale for Labor Day. It relaxes wrinkles, boosts collagen and hydrates beautifully, says Heshelow. The popular anti-wrinkle and anti-aging cream, Face Whisperer® Day Cream, is on a special Labor Day sale Monday and Tuesday (September 5th and 6th). "This is our signature cream, in our signature Face Whisperer® line," says Kathy Heshelow, founder of Sublime Beauty®. "This cream is semi-lucid, cool to the touch, and feels great on skin. It includes Argireline at 10% (the highest level recommended by the manufacturer)." ++ Hydrating with Botanicals such as cucumber, avocado, carrot extract, aloe and sweet almond. The Face Whisperer® line includes a night cream, a neck & decollete cream and an advanced eye get. Use exclusive code FWD35LAB for the Face Whisperer Day Cream at checkout on Amazon on Labor Day and Tuesday only. Read the more than 400 reviews. ABOUT: Sublime Beauty is a French-inspired skincare company, and brings a healthy approach to aging skin care. It has a special niche in Skin Brushing as well. Heshelow founded Sublime Beauty and Sublime Naturals as well as the monthly subscription box ZEN BOX, with essential oils.